Since we are gearing up for Christmas, there were Christmas decorations and gifts galore. This concept from Hyggelight is incredibly cool. First you burn the candle, once the candle is gone you use the container as a planter to plant the paper logo wrapper from around the candle, the special logo wrapper is full of wildflower seeds, so once planted you will have a house plant to enjoy. 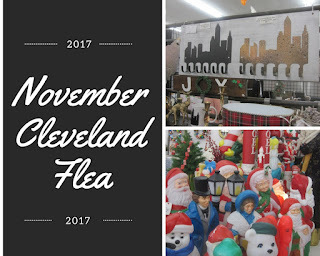 As this is the Cleveland Flea, the love of Cleveland was prevalent in most of the booths. These limited edition Cleveland skyline coat racks were from the Valerie Tyler Collection. Cleveland Field Kitchen was serving a variety of delicious looking treats including Grilled Cheese with Apple Bacon Jam, Shredded Brussels Sprouts with Aged Cheddar on Sourdough and Rosemary Herb cider. We had brunch plans after the flea (and I had way too many samples from vendors) but these donuts by City Girl Donuts looked too pretty to eat. Sweet Dish & Darling had a variety of soy candles in different containers, this month seemed to highlight the fireside tumblers and mugs (but there were other options). This Espresso Stout candles smelled heavenly, I didn't pick one up yesterday, but I will need to swing back by the flea to pick one up later this month. The Cleveland Pickle is one of our Flea favorites -- the mustard pickles are amazing, but we walked away with one of each variety. They are high on our list to try during our monthly visits to Cleveland to utilize our Playhouse Square season tickets in 2018. In shop they serve a variety of sandwiches featuring their delicious pickles and onion jam. Six Shooter Coffee was on deck providing much needed caffeination for the early morning flea-goers. Six Shooter Coffee is a small batch coffee roaster based in Cleveland, named after a story about President LBJ. The story goes that when LBJ would serve coffee on his Texas ranch it was so strong that it could float a revolver. Triple Threat Press is where we made one of our holiday purchases (it's a secret). Triple Threat Press is based in Cleveland and is a letterpress and graphic design company. And Process Collection Candles, a great gift for artsy folk! Papercutz also had holiday cards based on prints from their original collages created using vintage newspaper. Among the holiday designs included winter images of the Cleveland skyline; iconic images from A Christmas Story (set in Cleveland! ); and ornaments featuring their designs. Falcon and Flash really intrigued me, I hadn't seen them before at an event I had attended and their spice blend menu was incredibly unique. I purchased a few gifts here, but will be trying to get my hands on the Beet BBQ blend (which apparently creates killer tofu, I'm all about that). Some samples were available on Oyster crackers, but you were able to smell every blend and get recommendations before buying which was helpful for us. Nothing Bundt Cakes is new to the Cleveland area and we couldn't believe how moist these cakes were. Maybe I have just never had a good bundt before? The samples drew us in, because we ended up purchasing a bundtlet cake to-go. We enjoyed our time spent at the Holiday Flea, there have been other indoor events that we have attended in Cleveland that did not adequately handle the flow of pedestrian traffic which turned the event into a mess. Dave was worried this would be similar and expressed his concerns on our drive to Cleveland, but he ended up pleasantly surprised. We were able to walk around and visit all of the vendors without feeling crushed by everyone else in the building. I would recommend dressing warm or just leaving your coat on for the duration of your stay. Due to all of the windows in the building and the constant in and out of visitors I don't know how warm that space will get. We were perfectly comfortable just wearing our winter coats, but I would have been cold wearing just my sweater.